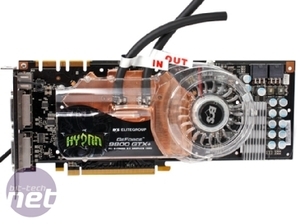 The 9800 GTX+ is something of a forgotten commodity in the current generation of graphics cards – a hanger on from the heady days of G92, when Nvidia ruled the roost and 8800 GTs roamed LAN parties in great graphics rendering herds. 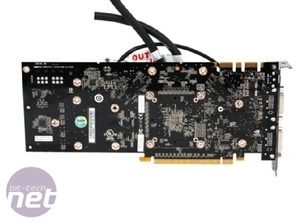 Sadly, for Nvidia at least, those days have now passed, with the RV770 powered family of graphics cards from AMD/ATI taking their place as the dominant GPUs on the market. And with the release of the Radeon HD 4870 1GB, it’s getting more and more difficult to justify throwing your lot in with team green. When we first looked at the 9800 GTX+ back at launch, we found it pretty disappointing in comparison to the card it was released to compete against, the Radeon HD 4850. Outperformed in the majority of games and around £20 to £30 more expensive than the HD 4850, it was the stereotypical also ran; not especially terrible in either performance or value, but utterly eclipsed by the brilliance of the Radeon HD 4850. The only thing it really had going for it was the launch of Nvidia’s PhysX GPU acceleration, which we’re disappointed to see has yet to make it into any triple-A game releases – a real shame considering the potential of such a large installed user base with CUDA-enabled GPUs. However, while we’ve previously focussed only on single GPU performance, we’ve yet to take either SLI or CrossFire multiple GPU set ups into our considerations. 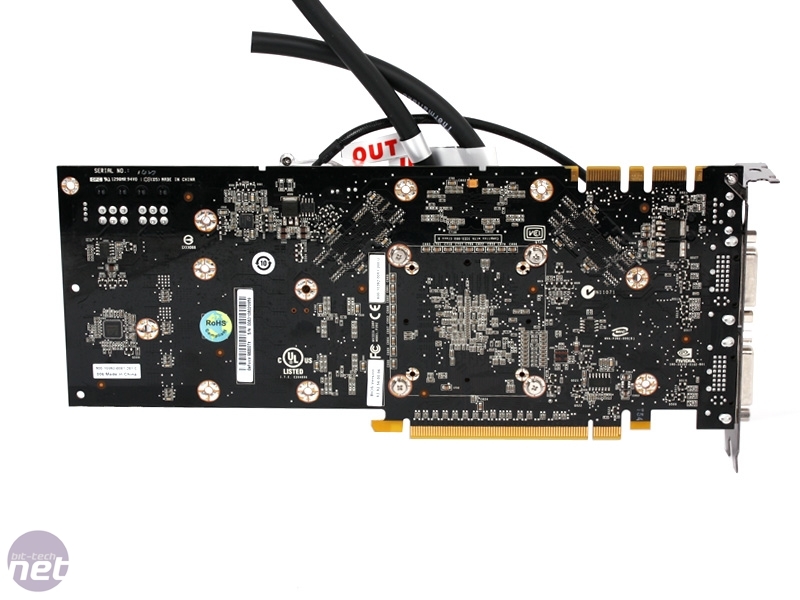 Could the 9800 GTX+ finally prove its worth in a multi-GPU setting? Or will it be another case of Nvidia’s card being outperformed by the competition? Read on to find out. 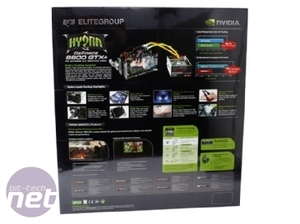 ECS will certainly be hoping for the latter, with its 9800 GTX+ Hydra SLI pack – a full SLI solution in a box. 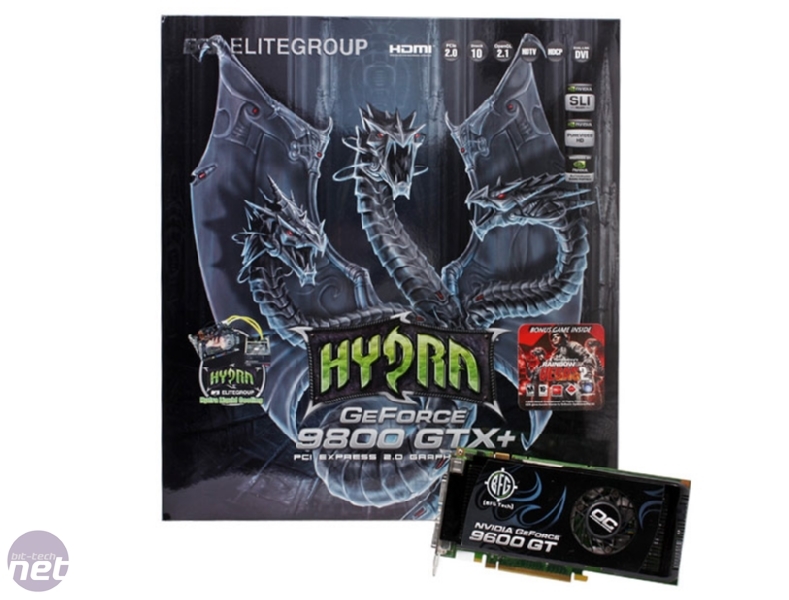 However, these are by no means normal GeForce 9800 GTX+ cards; they are watercooled and the whiney dual slot Nvidia stock cooler has been replaced with a pre-fitted Thermaltake Bigwater 760is dual 5.25” drive bay watercooling system and appropriate pre-fitted water blocks – all you’ll need to do is connect the appropriate hoses to the pre-fitted copper GPU waterblocks, fill the reservoir and plug it in, and you'll be joining the watercooled graphics elite faster than you can say "coolant leak!" 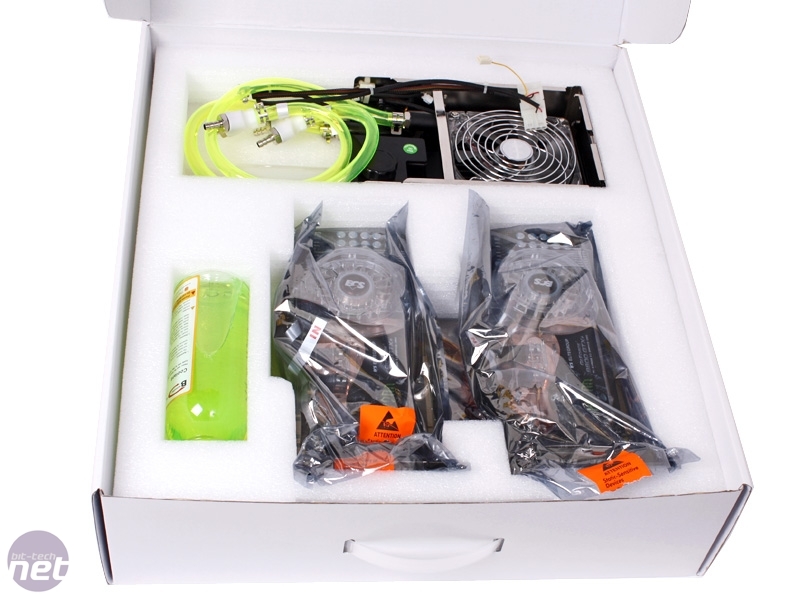 We’ll go into a lot more detail on the cooling solution in a bit, but it’s certainly good to see companies getting more and more innovative with all-in-one cooling solutions, especially lesser known graphics board partners like ECS. We’ve previously seen Zalman’s excellent LQ1000 Z-machine case make watercooling that much more accessible for the mass market, albeit at an extremely high price, so hopefully this won’t be the last we see of such an all in one solution. Sadly though, other than the pimped out cooling solution these cards still run at Nvidia's pre-determined reference clock speeds for a GeForce 9800 GTX+. 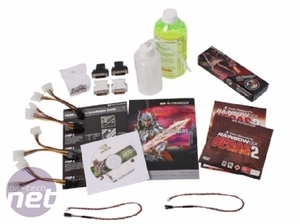 Unlike other watercooled partner cards like the MSI N280GTX OC Hydrogen or BFG Tech GeForce GTX 280 H2OC (we'll be looking at both shortly), which use the significantly improved cooling to allow for some the most aggressive pre-overclocks available on the market, ECS has chosen to make absolutely no alterations to the core, shader or memory clocks, and each card still runs with the default 512MB of graphics memory. Whether this is due to the default clock being close to the GPU’s maximum possible speeds, or just that the watercooling isn’t up to cooling an overclocked 9800GTX+ is a question we’ll be looking to answer. It certainly seems strange to go to all the trouble of watercooling a pair of cards only to leave them running at stock speeds – surely using watercooling gives the cards some headroom for a little extra juice? Bundle wise you certainly get a hell of a lot – the box for the kit is HUGE! 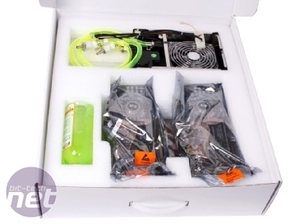 Inside you'll find, along with the two 9800 GTX+ cards with their pre-fitted Thermaltake waterblocks and the Thermaltake Bigwater 760is watercooling system, a whole bevy of connectors and cables with everything you'd possibly need to get the setup running. 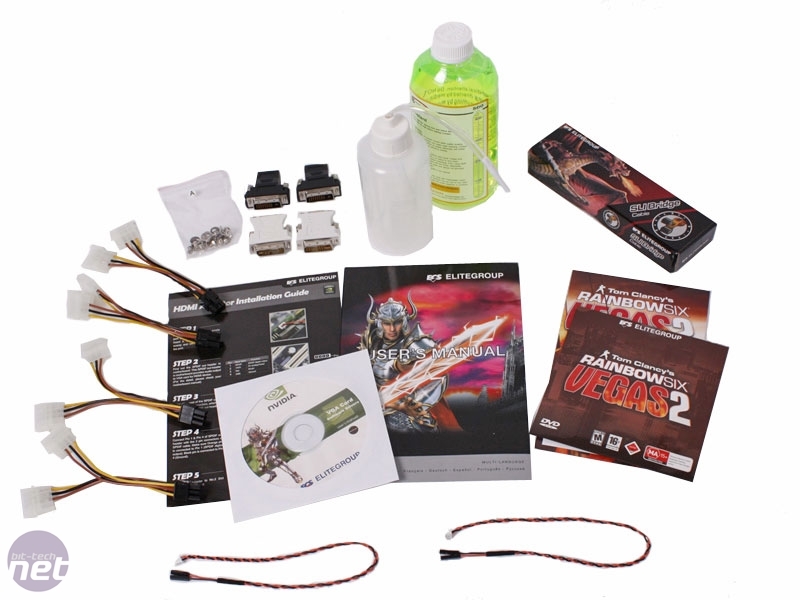 ECS have included four, four pin molex to six pin PCI-E power adapters, two DVI to VGA connectors, two S/PDIF cables, two DVI to HDMI plugs for high definition output to compatible displays, a full length SLI bridge and a full copy of Tom Clancy’s Rainbow Six Vegas 2, along with the usual array of user guides, instruction manuals and a driver disc. It’s certainly a very comprehensive bundle that we’re struggling to fault – it’s an excellent included hardware bundle, and you even get a game to stretch the kit’s graphical muscle too. 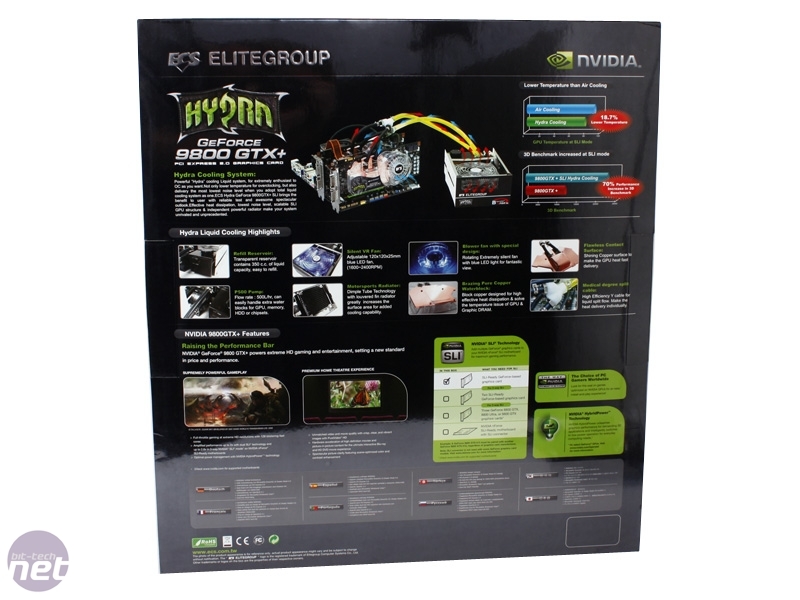 ECS offers a two year warranty that covers parts and labour with all of its graphics cards which. while more than you're legally entitled to, it a little stingy in comparison to larger Nvidia board partners which routinely offer five and ten year warranties. ECS spices things up a little by making the warranty transferrable should you choose to sell your card on the second hand market as well, which is a good thing without a doubt. The first year of the warranty is handled by the retailer where you purchased the card, while the second year is covered by ECS directly. We've been waiting for ECS to come back to us answering questions about where its closest RMA centre is to the UK, but we are yet to receive a response – we will update this as soon as we receive the information we've requested. Memory manufacturer Kingston has released a couple of sneak previews of a new liquid-cooled range of RAM, expected to launch at CES next month. CeBIT 09: Created by BMW Group in the US, Thermaltake's new Level 10 is an awesome design, but will it be king of quality? Thermaltake's latest CPU cooler is so hot off the production line you can't even buy it yet, and it's stacked to the nines with over 1.5m of copper heatpipe and two monster arrays of copper cooling fins - but how does it compare when faced with the toasty bit-tech testing system? Read on to find out.